Palau, a land of reefs and relics from WW2. With connections via the American island of Guam or Tapei in Taiwan, nowadays it’s not difficult to get to the islands of Palau even if they do seem very far from the UK. 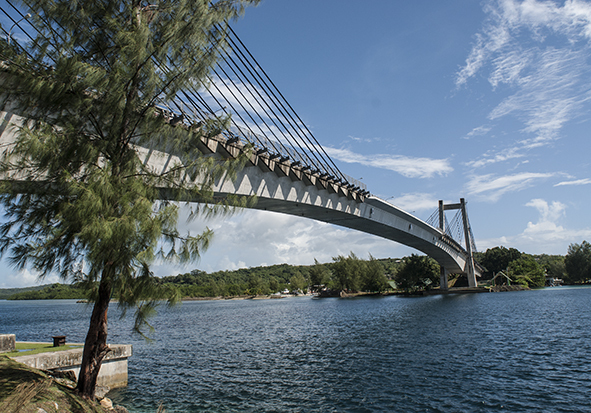 The biggest island, Babeldaob, sounds like it featured in Jonathon Swift’s Gulliver’s Travels, but the main town is situated on Koror and linked by a famous new bridge. It’s famous because the first modern bridge that was built here not so very long ago fell down, giving international lawyers a field day deciding who was to blame. 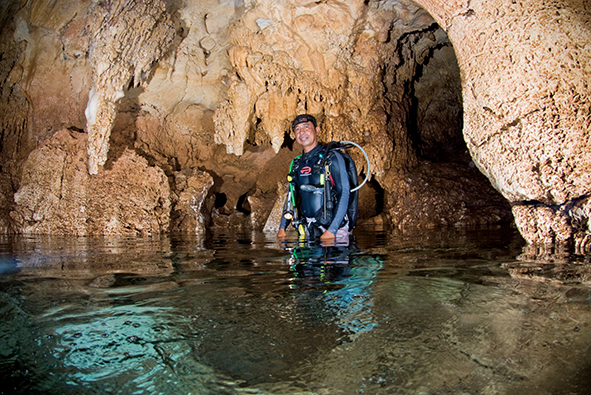 The islands have had a reputation for good diving almost since scuba was invented. That’s because this tropical archipelago in Micronesia lies at the confluence of the mighty Pacific Ocean and the Philippine Sea. Nutrients brought in by the various currents feed a wide variety of marine life. There’s simply so much to see. During my initial visit many years ago, I found myself doing more than thirty dives from a liveaboard dive boat in my first week and worried that my second week shore-based might be a little boring. After all, I thought I’d seen everything Palau had to offer – but I hadn’t. 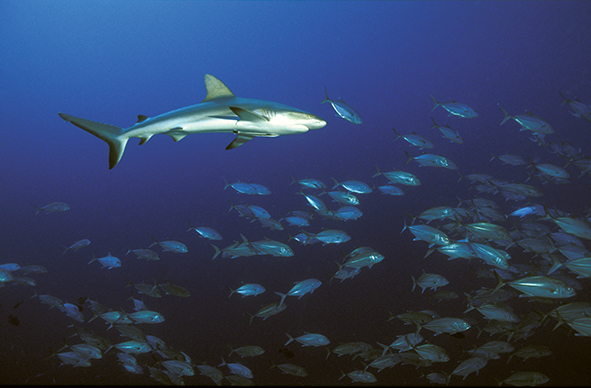 What sets Palau apart is the sheer variety of its diving. There’s so much of it. You may have heard of the famous wall dives like Blue Corner, the Ngemelis dropoff (or Big Drop) and Peleliu Cut where blacktip and grey reef sharks endlessly patrol the margins and huge Napoleon wrasse haunt the back reef. The sharks enjoy the ocean currents because it means they don’t need to continuously swim to force water through their gills. We divers find it best to hook to the substrate of the reef and, securely attached by a line, inflate our BCs a little so that we fly above the reef effortlessly while we watch the show. 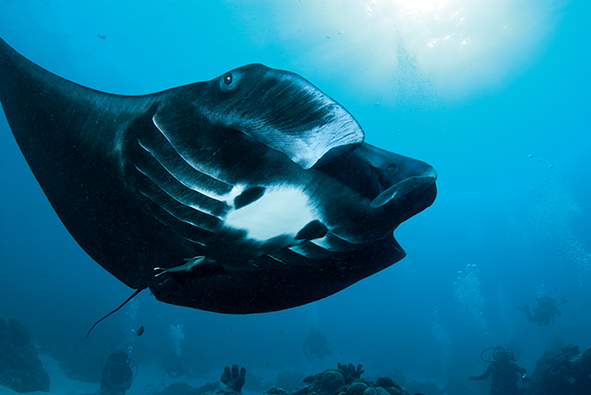 You may know of the channel dives such as German Channel or Ulong Channel with their manta cleaning stations. German Channel was cut through Palau’s barrier reef when it was under German administration at the beginning of the 20th Century. It gave ships access to the lagoon at Koror. More than a hundred years later it looks an entirely natural phenomenon cluttered with corals and giant clams. Once you’ve grown tired of looking at big fishes and burgeoning coral reefs, Palau still has more surprises to offer. The rock islands of Palau have that unusual head-of-broccoli look thanks to a marine organism that eats away at their bases in the tidal zone. I’ve often climbed the steep sides of the island, Eil Malk. It features a seawater lake in its centre. Water may seep from the ocean through crevices in the rock but animals are trapped and a vast population of jellyfish has evolved without long tentacles or a sting because they no longer needed such a defence. During the night they lie in deep water but come sun-up they propel themselves into the shallows so that the symbiotic algae within them can receive enough sunlight for photosynthesis. It’s great fun to snorkel in amongst these harmless creatures, each the size more or less of a tennis ball, and one could scuba if you could find someone to lug your scuba gear up the steep incline to the lake. That said, be aware that deeper there lies a bacterial layer of anoxic water laced with high concentrations of hydrogen sulphide so, if you do use scuba, stay shallow or you may get sick. Near Blue corner is the Blue Hole. It’s a cathedral sized cavern formed by the reef with a four vertical chimneys providing apertures at the top that allow the tropical sun to stream down in dancing shafts of light. Equally spacious, Chandelier Cave is a true cave with stalactites and stalagmites. There is no natural light once you’re away from the entrance do it’s quite daunting to enter at first and you need a reliable underwater lamp, but there are lots of air spaces where divers can surface and hold conversations about the wonder of it all. During WW2, Palau provided the Japanese navy with an important forward operating base. You may recall that General MacArthur fought an ill-thought-out battle to take Peleliu island because it had an airstrip and cost the lives of an awful lot of young men in doing so. The main lagoon at Koror was used as a natural harbour and in 1944 nearly forty Japanese ships were destroyed during an American air strike called Operation Desecrate One. The Americans mined the channel so that all but a few of the ships were trapped and their remains still lie in the relatively shallow lagoon. In 2004, sixty years after the event, I was privileged to dive with Tomimatsu Ishikawa, the Chief Engineer of the fleet-oiler, Iro. He escaped when his burning vessel went down, but as an old man in his late ’eighties, we took him diving on his old ship so you can say he survived its sinking twice. You can read about it in my book Amazing Diving Stories. Although the visibility in the lagoon is less good than out on the reefs, it makes for interesting diving on a wide variety of WW2 vessels that lie in this watery grave although not all are safe to dive or have even been properly identified. 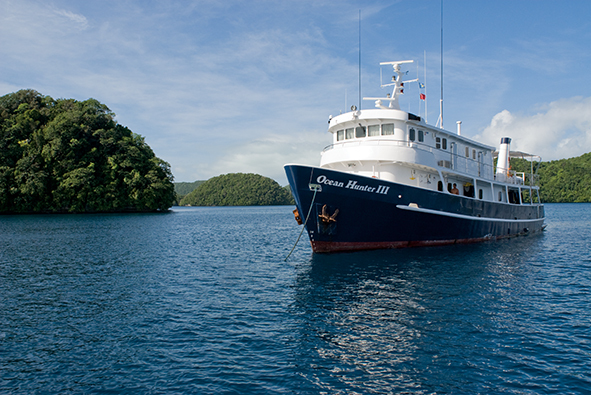 The question always arises whether it is better to dive Palau from a liveaboard dive boat or to be based on the shore and access the dive sites by fast skiff. The hotels in Koror are by no means luxurious unless you stay somewhere like the fabulous yet expensive Palau Pacific Resort. However, there are lots of dive operators with Fish ’n Fins probably the longest established and now efficiently run by Navot and Tova. Palau is tidal so it’s important to dive the sites when the conditions are right and they know when and where to send you diving. If you prefer to be on a liveaboard, the beautifully clean Ocean Hunter III is owned and operated by the same couple, together with the much smaller Ocean Hunter that may be a little cramped but only carries a handful of divers at any one time. Tova is something of a gourmet chef (she’s written books on the subject) so it’s no surprise to discover that the food onboard both these vessels is nothing short of excellent. Having the owners living on the spot makes a huge difference to any liveaboard operation. Standards are maintained to the high level set by the owners yet they can take advantage of the skills of local skippers who understand the prevailing sea conditions. Be sure to take an underwater camera with you when you diving in Palau. 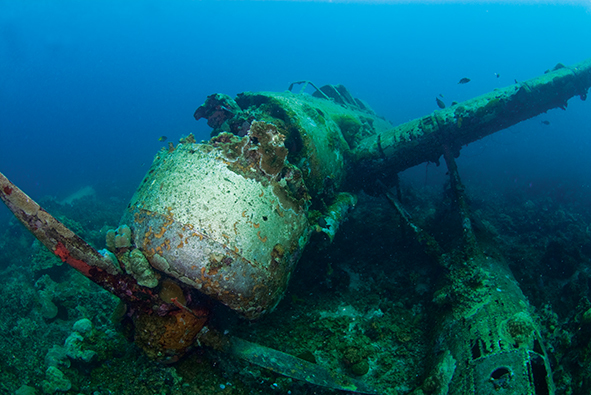 You’ll be diving reefs and wrecks, lakes and lagoons, seawater caves and even the remains of a Jake seaplane, sunk at its moorings in 1944. 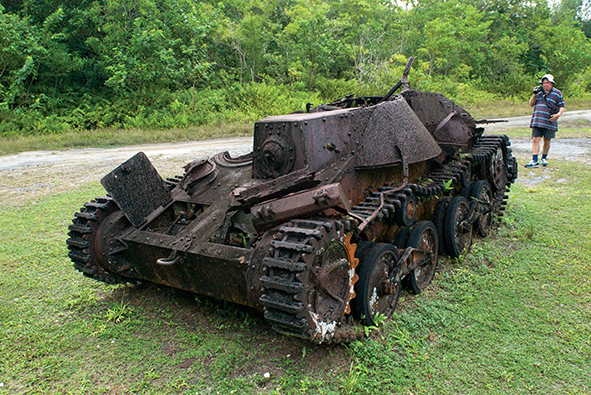 If you’re interested in WW2 relics, when you’ve done diving there’s plenty to see around Koror and Peleliu. Go to Peleliu and marvel at the way so many young American marines gave their lives in taking the well-established gun emplacements that still remain. Take a jeep and drive around the hinterland of Korar and stumble across battle tanks abandoned and left to rust. It’s a thought-provoking experience.